I have accidentally come across something that links with the Carnac enquiry, and I would like to know if any others detect it. I was alerted to the TV program re Helston in Cornwall and the many cases of bone cancer in children there. I have only seen one such case in an adult female near the Welsh border who recovered after the main energy line was rectified with a flattened wire coil. I map dowsed the Helston area (note the name HELL_STONE) They may have had the problem before; stopped with a large stone? If so, perhaps a stone has been moved with modem works “by clever man”. I circled the area asking for an energy flow that could cause this aberration of bone growth on a small map and got a strong flow from out at sea. 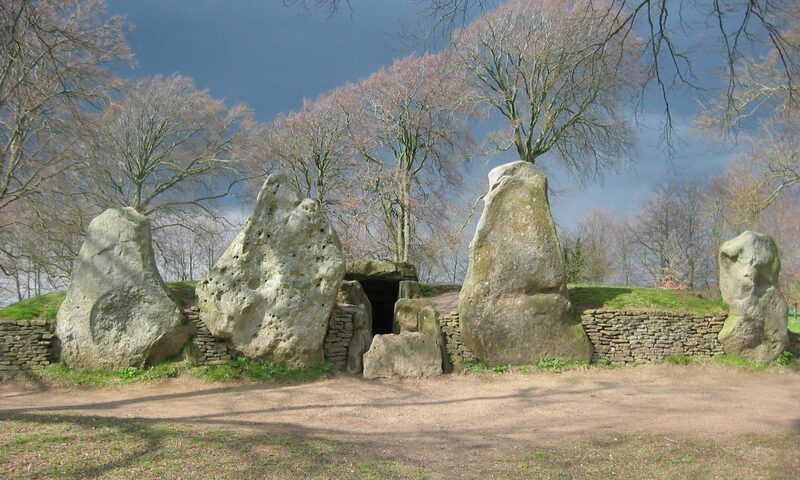 Followed back; it described a great arc leading to Carnac area. I have not been there but looked it up on the Net and found something worth enquiry. I will try to get it verbatim, but it describes a row(s) of stones in a wood that curves gently at Petit Menec, changing a “WSW alignment to an ENE” alignment. If correct, it describes a reversal loop. The flow connecting Helston could be the WSW one and the NE one goes back to Dieppe area on a parallel alignment with our Michael and Mary lines. Dowsing shows the line has positive rotation both sides (cancer influence, also noted over Helston) and heads for the Channel tunnel where it crosses into Britain. Further work on maps back to N. Africa shows the Earth Stress pattern linked with the recent earthquake has a Northerly energy flow from Gibraltar to Carnac area. If the Gibraltar rock is involved, it is formed of a bone-like calcium marble, information from which may link with bone growth. There is another power connection from/to Carnac & the central European Spiral that I spoke of previously, just South of Frankfurt. This Spiral formed only as the number of atomic power stations increased. I was dowsing it some years ago when there was a great earthquake in Armenia when I dowsed the great energy flash-over to Armenia to/from it. Carnac now looks even more like an energy screen/ modulator, for that curved alignment shows that it may have been taking in the overflow from Helston (Heel-stone or the last stone on the line ?) and turning it into the safe NW alignment that should have a polarity of almost zero, (see my article in June Edition Journal “Ancient minds in Ancient Times” making it almost undetectable. We have created a short circuit by inserting our new tunnel. (That WSW does not look right, though the curving flow from Helston may have terminated at Carnac as an anticlockwise scroll that would approach Carnac stones from the WSW).